We just launched the first set of self-service tools that allow you to setup and configure new dashboards. You will be able to create new dashboards, map your workflow, invite colleagues, and manage your plans using the very same UI as what you’re using to access your data and charts. You’ll find these tools under Settings in the setup menu. You can manage and create new dashboards. Selecting Create new dashboard will launch a wizard that guides you through the dashboard creation process. Once you've authorised your tool and selected the board/project you want to track, you will be given tools to specify your workflow so that the reported metrics reflect your specific way of working. 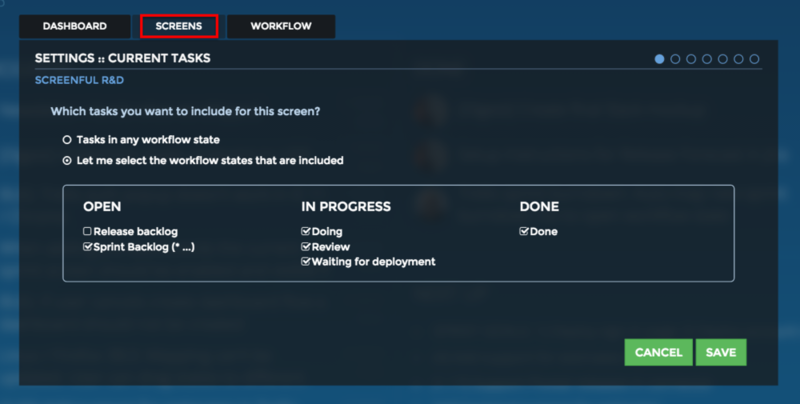 To build your dashboard, Screenful needs to understand a bit of your workflow. In order to show metrics that reflect your specific way of working, you need to specify when the work is started on a task, and when a task is considered done. When creating a new dashboard, use the mapping tool to map your workflow states to Open, In progress, and Done. You can always update this mapping later by accessing the mapping tool in the workflow tab. Under settings, you have now two new tabs that allow you to configure your dashboard. You can configure individual screens under the screens tab. In the dashboard tab, you can specify which screens are included in your dashboard. Just unselect the boxes that you don't want to keep and click save. You can always come back and include them again if needed. Now, go ahead and give it a spin, and stay tuned for more goodies in the coming months! Start your free trial or follow us on Twitter!